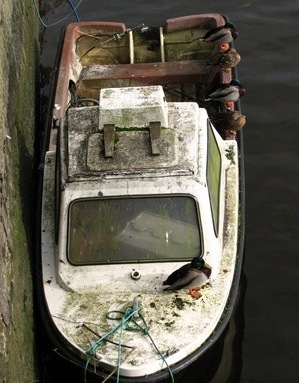 On my wanderings today I saw a murder of crows, a murmuration of starlings, and a sord of mallards on a boat (pictured); and although I saw a heron, it was unaccompanied so I can’t truthfully say I saw a siege of them. Nor did I see a charm of finches or an unkindness of ravens, but the day is still young. 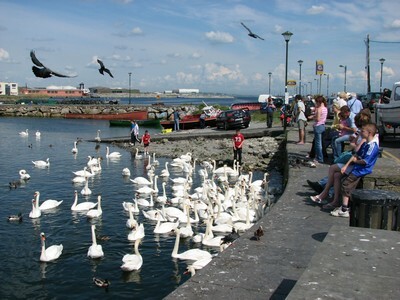 Living on the Atlantic coast brings me into regular contact with a variety of sea and city birds. In the case of the more timid birds “contact” is an exaggeration, but a gentle tread and a zoom lens help shorten the distance. With its human-swan metamorphoses, The Children of Lir (versions here and here) was one of many Irish legends that entranced me in childhood. Back then such stories felt more real and historical, and were not quickly classified as “mere fiction”. Far from it: I remember feeling fierce disappointment upon learning that dragons did not exist. If that’s so, I thought, how does everyone know what they are? Needless to say, I was too young for Jung. Ideas of nomenclature and definition fascinated me and took me on random pursuits of meaning through the pages of my pocket English dictionary. I puzzled over the inevitable cul-de-sacs and epistemological ambiguities, though that’s not what I called them. The end section of the book opened up further avenues of intrigue, not least its geographical and natural lists. I knew the heights of the highest mountains and the lengths of the longest rivers. But the list that tickled me most was the one of collective nouns for animals and birds. How odd and evocative these terms were! Who ever thought of a shrewdness of apes, or an exaltation of larks, and why? There’s no short answer, but you can read lists compiled by Narena Olliver and the Oxford University Press, and commentary from Terry Ross and Michael Quinion. A quick note on stonechats before I disappear outdoors again. They are small birds of 11.5–13cm length, about the size of a robin. They are named after their alarm call, which sounds like two small stones clacking together. They also sing. Stonechats build nests of moss and grass on or near the ground, then they make them cosier with wool and feathers. To protect themselves from predation they like rough land such as heathland, and coastal terrain with good cover, such as that provided by furze (gorse) and other dense shrubbery. The male (above, right) is a colourful fellow, especially in summer, with a black head, orange-red breast, and white patches on his neck, wings, lower belly and rump. The female (above, left) looks similar but with a brown head, less bold breast colour, and less clearly defined white patches on her neck. They’re beautiful creatures, don’t you think? I took those photos on separate days, so for those of you wondering, I don’t know whether there is a romantic connection between the subjects. More to the point, I haven’t found a collective noun for them. Any suggestions? If I hear one I like, I’ll start using it! This entry was posted on Thursday, March 19th, 2009 at 4:40 pm and is filed under nature, phrases, stories, words. You can follow any responses to this entry through the RSS 2.0 feed. You can leave a response, or trackback from your own site. A pleasure for my eyes. Thanks, Stan. And – ah! – the Children of Lir. A pleasure, Sean. Thanks for the link to your own swan moment. Great post, Stan. If it’s an unkindness of ravens, might it not be a (stoic) kindness of stonechats? They seem sort of resilient fellows to me. Thanks PK. I like kindness of stonechats, and when I searched YouTube for corroborative material, the first two videos I watched seem to testify to the kindness of stonechats! (Strangers no longer.) The first shows a male who returns to give the cameraman a quick encore; the second shows a stonechat not eating a centipede. The third video is my favourite, though it contains no evidence of kindness. I wonder if your beautiful swans would have danced to Tchaikovsky music. Having seen the Ballet, I’m sure that the choreographer had observed the gracefulness of swans. Thanks for the interesting, amusing link. I’m with the sparrows most of the time. Although Schoenberg appeals to me when life is disturbing. You’re very welcome, Claudia – thank you for the visit and comment. You might also enjoy this illustrated article on birds that inspired classical music. Discordance also has its moments for me, but like you I usually prefer melody. When I was growing up, practising Bartok made everyone flee the room, but ragtime brought them back again! As for playing music to birds, I can hardly think of a better job. Let me know if they’re still hiring! I have a small music studio called Chanterelle (from the French word ‘chanter’:’to sing’.) I will share this superb article with my few students. I’ve already often mentioned how much nature inspires composers (at least, in the titles!). Your link will complement my observations. Many thanks for your attention and generosity. Oh, that’s good to hear, Claudia. It’s hard to resist sharing material which seems relevant and worthwhile, but sometimes I overdo it, and I imagine that the recipients feel obliged to find the material enjoyable or interesting. You have persuaded me that I did the right thing, at least this time! Now to overdo it. Here are short articles on how birds learn to sing and how they sing. Dan Mennill has done fascinating research into birdsong, supplementing his recordings with spectrograms. Finally, on oliviermessiaen.org there is a page comparing the sounds of his Oiseaux exotiques with the birdsong that inspired them. The website crashed my internet connection, but most graphics-intensive websites do this, so you might have better luck. It seems safe anyway. Many, many thanks for those incredible links, not only about birds’ singing, but animals’ talking. So wonderful to be right in the midst of nature in my small apartment. Two years ago, I bought Dan Gibson’s tape:’Listen to the Loons’ in order to survive the sunless winter. It helped! Now I’m rich beyond words. De rien, Claudia. Coincidentally, I sometimes use an audio file of a loon’s call to alert me to a new email message. At the moment, though, it’s a lark’s! If you still have it, is your lark’s alert playing pranks with your messages and callers? Curieuse…..
Claudia: Yes, the lark lives on in my computer, but at the moment it signals my switching it off. A loon lets me know of an email hello. Sometimes I use film clips or other sounds, but I keep returning to birdsong. It is as Lamartine wrote, in your earlier quote! Or are you asking something else? I’m not sure what pranks you mean. Isn’t lark also a carefree adventure, harmless piece of mischief? I was just wondering if having a lark as a signal, would create havoc in a calling system? Just crossed my mind when you linked us to this post with your present entry, and I reread your last comment. I still go to many of your interesting birds’links. Thanks! Ah! Yes, lark has two common meanings. Its other meaning was not lost on me – I even talked myself out of a bad pun with it – but I missed it in your comment. And now I’ve drained the life out of your lark by having you explain it! Regarding havoc in signalling, you may be right – and sadly the havoc works both ways. Less distressingly, I am reminded of a recent incident when a friend’s dog seemed to hear a sound coming from a computer, but neither I nor the other two humans present could hear it. There are so many signals we don’t ordinarily detect. I’m very glad to hear that you still enjoy the bird links. Merci pour ton message. Contente que tu apprécies la citation de Lamartine. Très belles photos dans ton poste récent. The end of a lark, they used to say in England (and perhaps Ireland too) is the beak (the magistrate). I like that, John! Don’t think I’ve heard it before.